A compilation of 6 previously issued tracks plus one exclusive track "Gutters Of New York City". Released for the show at The Pyramid (NYC) that took place on May 8th, 2001. Limited to 50 hand-numbered and signed copies. 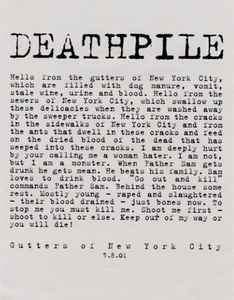 This was self-released by DEATHPILE but is not part of the Malsonus catalog. All tracks were later issued on the "Final Confession" CD.